"I adore Thee from the abyss of my own nothingness." VERY rarely does one come upon exquisite architecture in Manila. The Magallanes Adoration Chapel is one of those exceptional pieces. The chapel was done by architect Dominic Q. Galicia, who was graduated a few years ago from the University of Notre Dame in the United States. 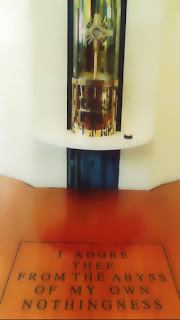 The adoration chapel is at the St. Alphonsus de Liguori Church in Magallanes Village, one of the more outstanding works of the National Artist Leandro Locsin that deserves national preservation status. Within the context of working within the confines of an existing structure, and a Philippine architectural icon at that, Galicia solves the sensitive question of how to respectfully tuck a chapel into a church. His new construction stands out, but is in total harmony with the Locsin structure. Fitting something new into an old structure is something that is rarely done in this country. Respecting an old structure is outside the consciousness of many Filipinos. What normally happens is that either the old structure is taken down to give way to the new, or the old structure is remodeled beyond recognition. Local architects have taken a design cue from the outdated Intramuros Code, which states that a new structure can be "compatible" with the old if it looks like the old, and should the new structure be of contemporary design (that is, not duplicating architecture from another era like all of the new repro-architecture in Intramuros do) it should somehow repeat some of the original design elements from period architecture. In other countries, the old mixes with new seamlessly in a way that the old still looks obviously old and the new looks very new. But not here. A string of architectural pastiche monsters have been proudly created in Manila in blithe misrepresentation of the Intramuros Code. Galicia sensitively fits an adoration chapel into a small triangular space at the rear of Magallanes Church. He does this straightforwardly, introducing a new vocabulary of wood construction that is in agreeable counterpoint to the heavy, dated concrete details of the church. In between the heavy, sculptural concrete fins that support the shell of the church, Galicia wove strips of different Philippine hardwood to enclose the small adoration chapel. The texture of the wood joined with the precision of Zen carpentry softens the brutal hardness of the concrete by introducing a decidedly human touch. A trellis-like canopy of wood peeps out of the concrete, signaling the location of the adoration chapel. Under the trellis, the new chapel is entered through a pair of sliding doors at right angle to each other, that when slid open, makes the building corner disappear. The new structure is as light as it is transparent. The only walls added are constructed of narrow wooden slats that instead of being solid, appear to have been woven. Bands of light stream in from the narrow slits of open space between the slats. 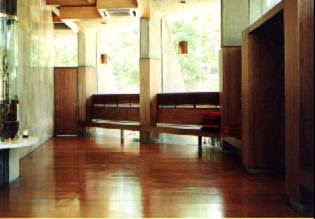 Wooden walls turn out to be sliding doors. 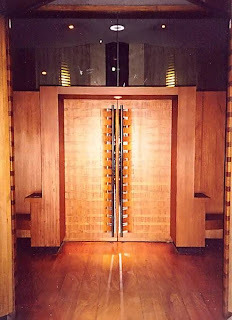 At the end of each panel, the bands of wood fan out slightly to hold a floor-to-ceiling rod that serves as the door handle. Polished wood of different colors and texture frames polished beige marble slabs. Sheets of transparent glass open the landscaped garden into the chapel. The natural-colored concrete envelope that the little chapel is tucked into is always evident. There really are no solid walls added to the original concrete walls of the structure. It looks like Zen carpentry at first glance, but is it? The weaving of hardwood strips brings a sawali-like transparency. Two sets of walls (one exterior and another interior) slide open to disappear, connecting the sanctuary to the foyer, and ultimately opening out to the landscaped entrance. It brings the outdoors in, and brings the sanctuary into contact with the lush planting around it. An expanse of floor-to-ceiling glass further achieves the transparency so valued in Philippine architecture that is achieved by this small chapel. The elegant juxtaposition of natural materials and textures of the new structure adds a visual lightness that the original Locsin structure does not have. Think of the bahay kubo, a house that really is a basket woven out of bamboo raised on poles. There are no solids in the small, one-room bahay kubo. Wall and floor surfaces are like a hand-woven basket that lets air and slivers of light into the structure. In a bahay kubo, one is enclosed but always in touch with natural surroundings and ultimately the sky beyond. Galicia achieves the same feel in his small chapel. So, it really is not Zen carpentry. 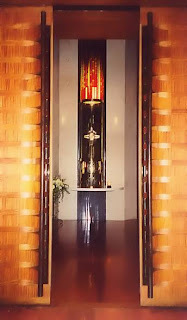 It is craftsman-like Philippine carpentry that makes the adoration chapel a space to remember. 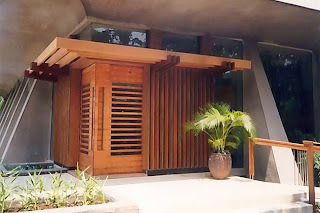 The architecture subtly touches the cultural chords of traditional Philippine architecture, although it reinterprets traditions in a thoroughly contemporary way. Impeccable architectural detailing is also what makes the adoration chapel. Every surface and every joint was thoroughly planned out, true to what the Bauhaus architectural icon Mies van der Rohe said in the 1930's, that "God is in the details."